Your home is probably the single largest investment you will make in your life. So it’s important to protect that investment. Nothing protects your home more literally than your roof. Your roof keeps the elements out of your home and protects the structure of your home from damage. But when the roof itself starts to succumb to the elements, your whole home could be in danger. 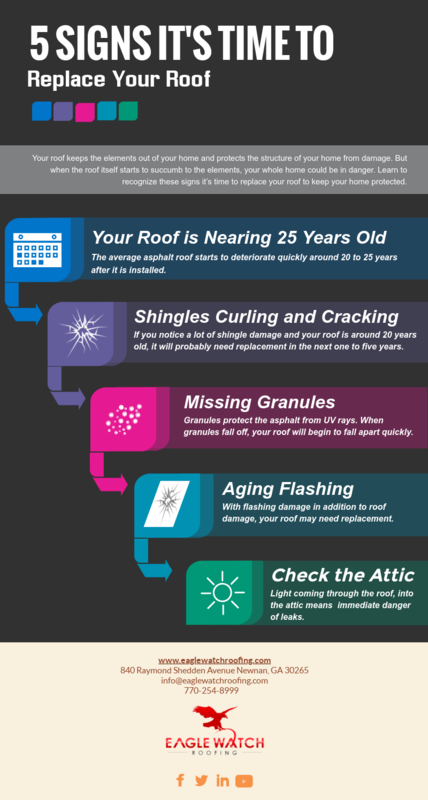 Learn to recognize these signs it’s time to replace your roof to keep your home protected. A shingle roof can last anywhere from 10 years to 50 years. Maintenance is a large factor in the lifespan of a roof, but weather is probably the most significant factor. The quality of the shingles is also an important part of how long an asphalt roof can last. 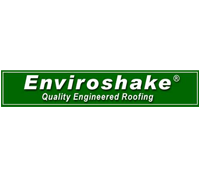 However, the average asphalt roof starts to deteriorate quickly around 20 to 25 years after it is installed. If you notice other problems with your roof and the roof is nearing the 25-year mark, it may be time to consider a roof replacement. Another sign to look for is what your neighbors are doing. If you notice a lot of your neighbors replacing their roofs, pay attention. Most likely those homes were built at the same time as yours and certainly have had to withstand the same weather. So if their roofs are going, yours can’t be far behind. If you notice a lot of new roofs in your neighborhood, it makes sense to at least have your roof inspected. Contact Eagle Watch Roofing, and we can do a complimentary roof inspection to check for any damage. Curling and cracking shingles are signs of weather damage. If you notice a lot of shingle damage and your roof is getting up around 20 years old, it doesn’t mean that anything is wrong with your roof. It just means that it’s aging appropriately, and it will probably need replacement in the next one to five years. Curling comes in two variations. Cupping is when the edges of a shingle start to curl upwards. The shingle begins to resemble a cup. Clawing is when the center of the shingle begins to bulge upward. In either case, the curling shingle creates an opportunity for water to get through to your roof deck and potentially cause a leak. If you see just a couple of shingles curling, you can probably replace them. But if you notice curled shingles scattered around your roof, replacement is in your near future. Cracking is often the result of wind damage. If there was a particular event that caused wind damage, like a severe storm, you might need to replace an area of damaged shingles. But if the cracking is popping up all over your roof, your roof is probably reaching the end of its life. Like curling, cracking provides an opportunity for water to penetrate the shingles and make its way to your decking, your attic, and your home. It’s best to have a roof inspection and possible replacement before any serious damage affects your home. Asphalt shingles are covered in small stone granules, similar to a thin coating of gravel. The granules serve a critical function. Asphalt paper (what’s under the granules) does stand up well to sunlight. The UV rays, as well as the heat from the sun, can start to bake and degrade the asphalt. Eventually, this can cause thin spots or even holes. Obviously, holes in your roof is a bad thing. Thankfully, asphalt shingles are covered in granules that protect the asphalt from the ravages of the sun. But those granules can start to come loose. When that happens, your roof will begin to fall apart quickly. There are a few causes of loose granules. The first is damage from hail or storm-tossed debris. When anything impacts the roof, it can knock granules loose. If you’ve had a severe hailstorm, take a look at the roof and inspect for hail damage. Identifying small pocks where the granules have been knocked loose and replacing those shingles can protect you from more extensive repairs. If branches or other large debris have hit the roof, check out the shingles for damage. Another cause for loose granules is just age. 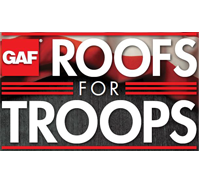 Over time, heat, cold, and weather will loosen the granules covering your asphalt roof. One way to check for loose granules without inspecting your whole roof is to check the gutters. If there are loose granules, they will be swept up in water draining from your roof and may end up in your gutters. When you see granules in the gutters all around your roof, you probably have extensive damage. If your roof is brand new and you see granules, don’t panic. Some granules will come off of newly installed shingles, and that’s perfectly normal. Flashing is an essential part of your roof. Flashing is shaped sheet metal that is installed in the valleys where roof slopes meet, and around anything that penetrates the roof, like chimneys and vents. The flashing in the roof valleys collects strong flows of water that gather there and directs them into the getters. Flashing around chimneys and other openings help keep water from penetrating the roof in these fragile areas. Some chimneys are surrounded by roofing cement that functions as flashing. Unfortunately, roofing cement can dry and crack, inviting leaks. If your chimney is surrounded by roofing cement, you may want to consider replacing the cement with proper metal flashing. An additional type of flashing called a saddle is installed on the up-slope side of your chimney. It is a small ridge that starts at a point up-slope from your chimney and widens out to cover the width of the chimney. The saddle directs water around the chimney, so it doesn’t gather on the up-slope seam of the chimney. If your flashing is worn or shows signs of rust or holes, it may be reaching the end of its life. Flashing can be replaced without replacing the whole roof, but if you notice flashing damage in addition to roof damage, it is a good sign that your entire roof is ready for a replacement. To check on this type of damage, you will need to get up into your attic. On a bright day, crawl up into your attic and simply look up. If you see any light coming through the roof, you are in immediate danger of leaks. There are probably serious problems with your shingles if the damage has gotten this far, but there could be other causes. If your attic feels hot and humid, there is likely inadequate ventilation. Poor ventilation doesn’t allow air to move freely under the roof, leading to warped decking and rotting shingles or underlayment. Also, check the insulation in your attic. If the insulation is wet or has water spots, you already have a leak. Get a roof inspection as soon as possible to avoid further damage. 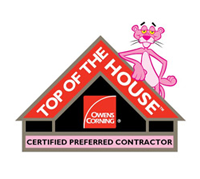 Whatever condition your roof is in, it is suggested that you get your roof inspected about once every three years. If your roof is reaching the top end of its life expectancy, you may want to have it inspected every other year so you can catch minor damage and aging before it becomes worse. 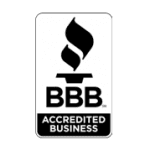 Eagle Watch Roofing can do a complimentary inspection of your roof. We’ll point out any areas of concern and suggest needed repairs. If the roof needs to be replaced, we can go over the costs involved and find the right plan for your new roof. Just contact Eagle Watch Roofing to get started.